Congratulations! You’ve hit the 6-month milestone! At times, it probably felt like you would never get there but I can assure you that the next 6 months will go by faster than you can say first birthday party! 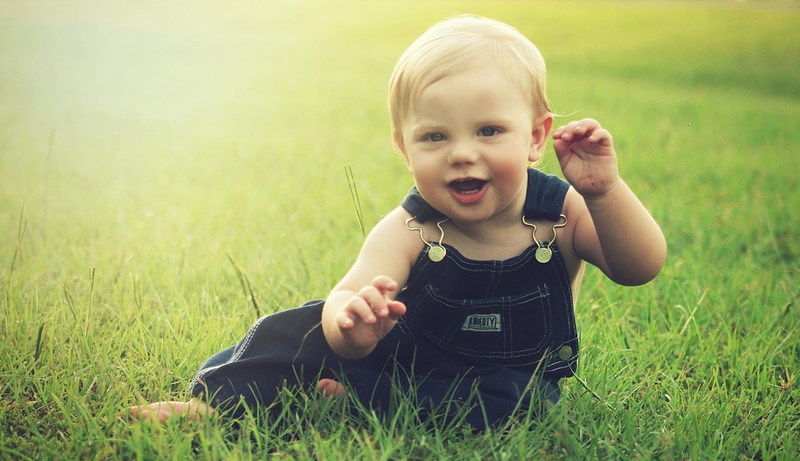 During the first year, your little munchkin will develop at an unbelievable pace and he or she will become more curious about the world around them. They will continue to develop their fine and gross motor skills and as a parent, we can’t help but wonder how we can stimulate our children just enough in order to promote brain development. Here at The Baby Swag, we’ve got you covered! We’ve compiled a list of the best toys for your 6-month old that is guaranteed to provide hours of endless fun while at the same time, developing different senses and stimulating your baby’s brain. We made sure not only to include a variety of conventional baby toys but also came up with a few “out-of-the-box”, home-made toys to ensure that money isn’t what’s holding you back when it comes to fun for your little one! Believe it or not, YOU are your baby’s favorite toy! Studies show that babies are mesmerized by different faces, whether seen in pictures, photographs or in real life and can recognize their primary caregiver’s face at this age. Accentuate one specific feature of your face by applying red lipstick to your lips or using dark eyeliner/mascara on your eyes. This will encourage your little one to focus on one specific “feature”. Feeling a little silly? Try making funny faces. Your baby’s eyes will be glued to your face as he or she studies the different expressions and they might even throw in a little giggle or two! Now is also an excellent time to start playing peek-a-boo with your baby. Not only is it fun and entertaining but you are also teaching your baby that objects can disappear and reappear. This is also a great game to play if your baby suffers from separation anxiety which usually occurs between 4 months and a year. At this age, your little bundle of joy will also be able to recognize your partner’s voice as well as yours. Use this to your advantage during play, but also to calm him down by speaking softly or singing to them when he’s upset. Your voice is the voice he seeks and associates with warmth, love and security as you meet his primary needs. When you speak, he or she is likely to turn to wherever the sound is coming from. For play, try out different pitches when speaking to your baby. Babies also love different animal noises, guaranteeing giggles and laughter for both you and baby! Last but not least, use your body to start introducing movement. Simple movement such as rocking or swaying your little one will provide stimulation and create spatial awareness (your baby’s awareness of where he or she is). Be sure to implement gentle movements at this stage as they still don’t have a lot of strength in their neck and can still easily become overstimulated. These games can be played anytime, anywhere and will strengthen the bond you already have with your baby and the best part? It doesn’t cost a thing. At the age of 6 months, your little one is likely to roll over without any assistance and might even begin to sit up with a little help and support. These developments are directly linked to your baby spending enough time on its tummy, also referred to as tummy time. You can begin placing your baby on their tummy from birth for short periods of time and increase this time as they grow older. Tummy time is essential in strengthening and developing the back and neck muscles which will assist them in sitting up unassisted, crawling and walking at a later stage. A tummy-time play mat can be excellent motivation for your little one to spend more time on his or her stomach and to further develop and strengthen their muscles. They provide ample visual stimulation and many playmats nowadays have incorporated toys containing different textures to stimulate the sense of touch. Jungle gyms can also provide hours of fun for your baby, especially when they are a little younger and spending more time on their backs, but in order to ensure that you are getting your money’s worth, Buy something that provides stimulation from above as well as when baby is turned on his or her stomach. Our favorite picks of playtime mats include Tiny Love Tummy Time Under the Sea Playmat, Fisher-Price Music and Lights Deluxe Gym, Rainforest, Baby Einstein Caterpillar and Friends Play Gym and the Gymotion Tummy Time Musical Playland from Yookidoo. Educational baby toys do not necessarily need to break the bank. Stacking cups are affordable, durable and great at developing fine motor and language skills. At six months old, your little one will be eager to explore the world around him and stacking cups provide a fun, safe and colorful way to do so. At first, your baby will explore the shapes with his hands (and probably his mouth), trying to manipulate and pick up the cups and develop their fine motor skills. These movements will appear uncoordinated at first and your little one might even get frustrated when they struggle to pick up the different size cups. Try giving him the larger cups first when exploring. Stacking the cups will come with time and keep your baby busy for hours on end but at six months, you can stack the cups for your little one, improving visual and depth perception as he perceives the tower you built. He or she will love diminishing your tower over and over again as babies tend to love repetitive play at this age. Talk to your baby while stacking the cups. Mention the different sizes and colors and describe the construction. Of course, they won’t have a clue what you are referring to at six months but hearing the words and description will develop their language skills of which you will bear the fruit once they begin talking. Note: Stacking cups are also great fun during bath time and easy to pack up afterward! Our top picks include The First Years Stacking Up Cups, The First Years Nesting & Stacking Up Cups from Homder, Kidcia My First Square Nesting & Stacking Cups and My First Stacking Cups from a GreatLife. It’s never too early to start reading to your child. Reading just one book a day can dramatically increase their vocabulary and you will be pleasantly surprised by the words they utter when they eventually start to talk. At this age, babies tend to love books with animals. Show them the picture, name the animal and here comes the fun part, imitate the sound the animal makes. Try buying thick, cardboard books as your little is likely the grab the book from your hand which could result in the book tearing. Plastic books are also great fun as they usually have colorful pictures and you won’t feel too bad when it eventually gets spit or food on it while material books usually provide sensory play for your little one. Not sure where to start? Take a look at these wonderful options: Our Best Soft Book for Babies, Sassy Baby’s First Books, My Big Animal Book and Sassy First Sounds Book Set and Cube. As we’ve already mentioned, babies love faces, including their own! They get very excited whenever they catch a glimpse of themselves in the mirror. It is still unclear whether babies are able to recognize their own face in a mirror at this age or whether they perceive their reflection as a “friend” but none the less, not only are they entertained but they also develop their visual perception, tracking every movement and reaction in the mirror. Babies also tend to babble at the mirror, aiding in the development of their social skills. Never leave your baby alone or within reach of a real mirror though as it can easily fall and break. Look for unbreakable baby mirrors. Opt for a good quality one as the images on baby mirrors can sometimes be a little unclear. We recommend the award-winning 3 in 1 BEST Frog Mirror, Fisher-Price Scoop & Nest Bath Mirror, Bright Stars Sit and See Floor Mirror and for a simpler version, the Galt Toys Baby Mirror. Your six month old will be attracted to sounds – it helps them to make sense of their new world and develops their sense of hearing by trying to figure out what exactly is making the sound and where it is coming from. Change your tone of voice from high pitched to low pitched and visa-versa to catch their attention. If you haven’t already noticed by now, they also love repetition at this stage which is probably why musical plush toys are so popular amongst six-month-olds. There are many soft baby toys that sing songs by a push of a button and if you add lights, you are sure to have a winner in your little one’s eyes. Also, try purchasing musical instruments to entertain your baby such as rattles and shakers which they can pick up and explore themselves. Be sure to buy something that is safe for them to use during this age and never leave them unsupervised with these toys. If you are strapped for cash, be creative – create your own shaker by using a water bottle and filling it will rice or beads. Seal the cap using super glue to ensure that your little one is not able to open the bottle. They will also love to hear you sing the same song over and over again! The LeapFrog Learn and Groove Musical Table, Fisher-Price Rattle and Rock Maracas, Baby Einstein Octoplush soft toy and the VTech Musical Rhymes Book will keep your baby entertained for hours! Now that your baby is a little more active during bath time and able to sit up with some assistance, you can even turn bath time into a fun, learning experience. Although not technically a toy, bubble bath and shaving cream will provide a great exploratory adventure for your baby’s senses as he or she explores the different textures. There are also plenty of interesting products on the market such as Crayola Color Bath drops that will change the color of the water. Keep in mind that your baby’s skin is still very delicate so opt for products that are gentle on your baby’s skin. Colorful squirt toys are also bound to be a favorite. At this age, your baby will probably just want to put it in his or mouth so be mindful of the size of the toy. We recommend that you purchase animals or shapes which will give you the opportunity to repeat the object or animal’s name, shape and even mimic the sound. As your baby gets older and begins to actively play with these great toys, they will have the opportunity to be creative in their play. Our favorite picks of bath toys include the Munchkin Float and Play Bubbles, Sassy Bathtime Pals and the Nuby Octopus Hoopla Bathtime Fun Toys. And don’t forget about the stacking cups as previously mentioned! If experience has taught us anything, it is this: Kids will play for hours on end not with shop bought toys, but with ordinary household items and the kitchen provide unlimited opportunities. When our kids were little, their favorite place was in our Tupperware cupboard. They used to explore the different shapes and sizes, pack and unpack, stack and overthrow and open the Tupperware for hours. We also made use of ordinary kitchen items for sensory play. Let them explore different textures by touching flour, rice, tin foil or even some jello. Pots, pans, and wooden spoons can be used as “drums” while other containers can be turned into shakers. Now, this goes without saying but always be careful in the kitchen and ensure that you create a safe environment for your baby to play in. Baby-proof cupboards so that they can’t get into any cupboards that contain glassware or chemicals and use baby proof plugs if you have any plugs within baby’s reach. She’s not called Mother Nature for anything. Exposing your child to the different elements and textures found outside cannot be beaten. Research has confirmed that kids need to experience and touch items in order for pathways (Synapsis) to form in the brain and that the most crucial time to establish these pathways is between the ages of 0 – 3 years old. The outdoors provides ample activities for kids, young and old, to learn. It is filled with shapes, colors, textures and natural elements. Let your baby play in the sandpit, crunch up leaves in autumn or pet animals if they have the opportunity to do so. Swinging your baby can help with sensory integration (spatial awareness and inner ear balance) and even a walk in the park will stimulate your baby’s senses as he or she takes in a new environment. The best part about it is that that in most cases, it can be free! Don’t over-complicate or overstimulate – There’s a reason why babies sometimes prefer to play with the box instead of the toy itself! Have fun shopping for your little one! Schoenhut vs. Melissa & Doug Piano: Which Kid Piano is Best?